In 1890 Boudin enjoyed a final period of creative energy. It was a year of intense work in which he had to respond to the increasing demand for his paintings and also prepare works to be sent to various exhibitions (Durand-Ruel was planning a major monographic exhibition that December). The artist turned to his favourite sources of inspiration: the sea, ports and beaches. He travelled to the Mediterranean, Holland and to his native region of Normandy where he spent part of the summer and autumn. We know that between 20 September and 3 October he stayed at the famous resort of Étretat on the Normandy coast. Situated north-east of Le Havre, Étretat was merely a small fishing village at the beginning of the 19th century with less than one thousand inhabitants. However from the 1830s it became a fashionable holiday resort and by the end of the century had 2, 200 permanent inhabitants, a number which increased enormously over the summer months. The fame of the place was (and is) based on its rugged rocky coastline, particularly the two cliffs which frame the bay. To the north-east (looking to the right if facing the sea) there is a sloping headland with a low arch known as the Porte d'Amont. On the opposite side is a higher (more than 80 metres) and more spectacular cliff called the Porte d'Aval with its divided summit known as the Aiguille. As the visitor gets closer to Amont from Aval this peak moves around until it can partly be seen through the arch. Boudin's beaches and coastal scenes are always peopled by numerous ant-like figures, either tourists or fishermen. In the present case, however, the painting has no figures and also lacks the village houses, the hotel and even the beach. The only sign of human life is the fleet of fishing boats returning from the catch, which furthermore seems more like a natural element, perfectly integrated as it is into the landscape (the sails appear like faint echoes of the peak of the Aval). For once Boudin, like the tourists, looked towards "pure nature." At the same time his vision is the complete opposite to that of the painters who, from the Romantic period onwards, had painted the sea breaking dramatically against the cliff (including Monet). 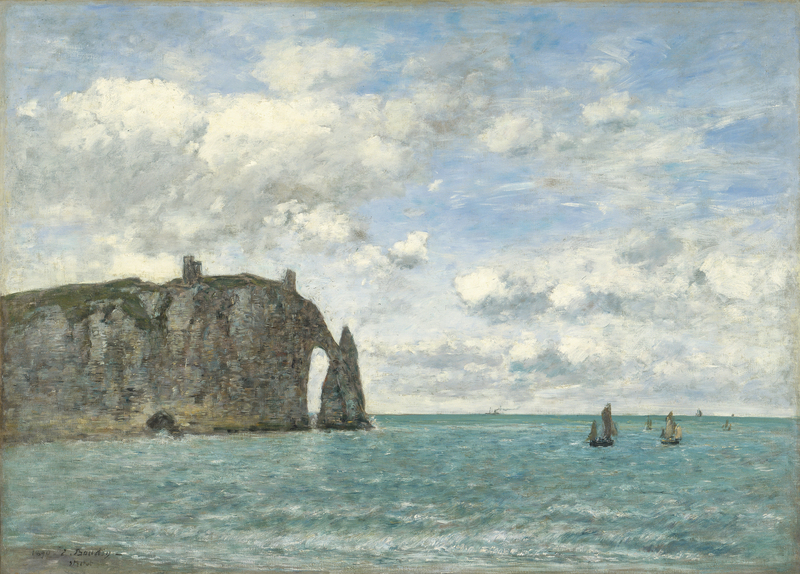 Boudin avoided this mood of the tragic sublime, and the agitated style of painting that accompanied it. His drama is a magnificently serene one, based almost entirely on the contrasts of light and in the atmosphere which envelops the whole scene. The dark silhouette of the Aval, balanced by the cloud formations, both connects and separates the seaand sky, creating a connecting passage from one to the other.